1st Gear: Italian supercar maker Lamborghini is considering adding an "everyday" model to its line-up, its chief executive Stephan Winkelmann said at the Reuters Global Luxury and Fashion Summit. Around 35,000 super sports cars were sold in 2007, compared with about 26,000 last year, he said. Strong demand from emerging regions such as China and Russia is boosting sales of high-end models. Referring to plans for a third model, Winkelmann said: "We are going to have a third model. It has to be an everyday car. We want to have a car which is able to be used on a daily basis." 2nd Gear: According to Autocar, Mercedes is considering a high-performance four-door that would slot into the firm's range above the CLS and give it a rival to Bentley's Continental GT. The dedicated hot model has been described to Autocar as an "über-CLS". It's likely that it would have an even more dramatic shape than the coupé-like CLS and feature AMG engines and chassis tuning to justify a considerably higher price. 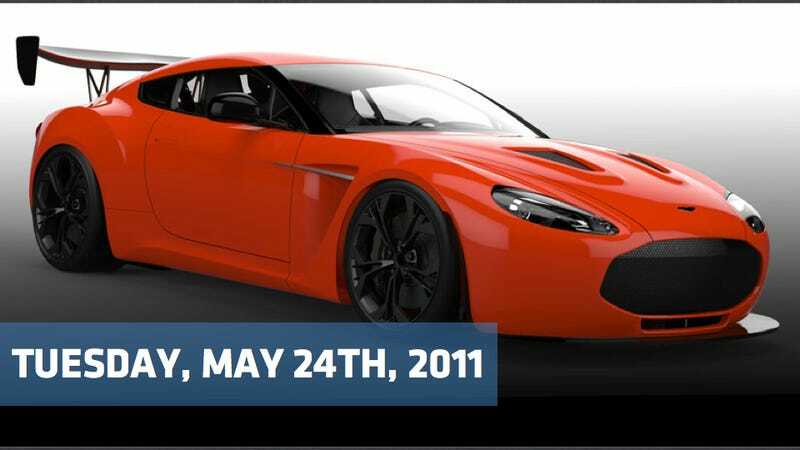 4th Gear: Classic Driver and World Car Fans report this morning that HBH, the company that helped to create the Kleemann GTK and Zenvo ST1, has announced plans to build a new mid-engine supercar based on the Aston Martin V12 Vantage. Details are limited, but the one-off model will feature a 6.0-liter V12 engine that has been equipped with two superchargers. Performance specifications haven't been released, but the naturally-aspirated version produces 510 hp (380 kW / 517 PS) and 570 Nm (420 lb-ft) of torque. 5th Gear: The Obama administration will announce today it is buying more than 100 plug-in electric vehicles and will install charging stations in government buildings in five cities, including Detroit. Because if there's one place it makes sense to have Chevy Volts, it's Detroit. I'm not even sure if I'm being sarcastic there or not. 6th Gear: Aston Martin has released the rendering up top of its new V12 Zagato racer, which will compete at the Nurburgring this summer. The 2011 Aston Martin V12 Zagato — to the left there — made its world debut at the Villa D'Este concours d'elegance at the weekend, where it won the Concorso d'Eleganza Design Award for Concept Cars and Prototypes. The racer hasn't been shown yet, but we'll see the Zagato in track spec shortly. It will compete at the Nurburgring this weekend in the 53rd ADAC ACAS H&R-Cup VLN race on 28 May.